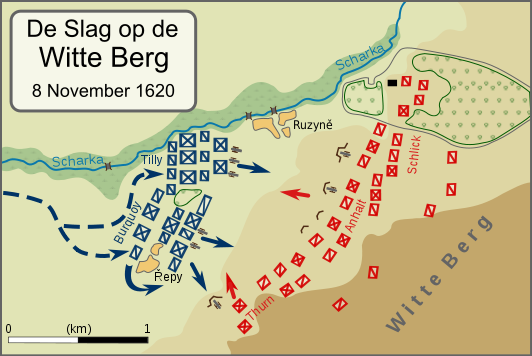 The Battle of White Mountain, was an early battle in the Thirty Years’ War fought on this day in 1620. An army of 20 – 30,000 Bohemians and mercenaries under Christian of Anhalt were defeated by 27,000 men of the combined armies of Ferdinand II, Holy Roman Emperor under Charles Bonaventure de Longueval, Count of Bucquoy and the German Catholic League under Johann Tserclaes, Count of Tilly at Bílá Hora (“White Mountain”), near Prague (now part of the city). The battle marked the end of the Bohemian period of the Thirty Years’ War and decisively influenced the fate of the Czech lands for the next 300 years.